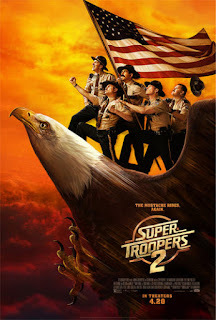 Read Mind on Movies review of Super Troopers 2. Everyone's favorite cops are back (by popular demand) with the long anticipated follow up to the cult comedy classic: Super Troopers 2. When the United States and Canada get into a dispute about the location of the actual border, the Super Troopers - Mac, Thorny, Foster, Rabbit and Farva - are called in to set up a new Highway Patrol station in the contested area. Our heroes quickly revert to their own brand of unconventional police work. 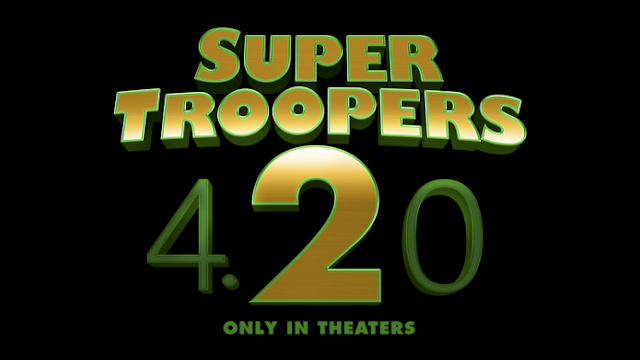 Super Troopers 2 is in theaters April 20th, 2018. The Super Troopers are back in this sequel and ready for more pranks - this time in Canada. When a piece of land is deemed part of America and Canadian soil, the Super Troopers are sent to patrol the area. Can this cult cop movie deliver to its followers? I was not a fan of the first Super Troopers movie and did not find much humor in its over the top juvenile comedy. That being said I did not have high expectations for its sequel. I must say I was surprised when I actually laughed a few times during this one because they toned down the loose based comedy and reeled it in a bit more to work more fluidly. If one joke does not make you laugh there is one that soon follows that might. This is because the jokes are non-stop with a lot of them being that silly comedy involving a big prank war at the hands of the Canadians. I will say the accents were awful which added to the humor because they went from Canadian to French to Irish to some mix I’ve never heard before. Also this movie had a plot that they more closely followed (although still lacking) unlike the first one. The jokes still were not enough to make me want to watch this movie again but I wasn’t completely bored while watching. I think it’s more geared to its followers which seem to enjoy this one a lot more. Your favorite cops are back it in the Sequel to the cult stoner film, Super Troopers. 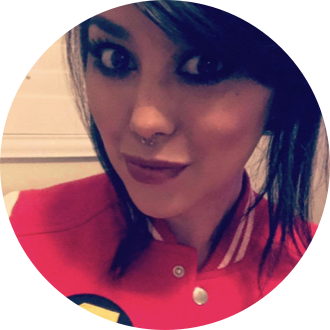 The team is together again after being let go due to the shenanigans in the first movie. They are hired as a unit to work in a small Canadian town that is now considered a part of the USA. They go there to Americanize and eventually hope to stay on as the police force. After a bit of rivalry with the current Canadian police, they stumble upon a bunch drugs and set out to solve the crime. The antics of the first film were lost on this one... there was only one scene playing jokes on drivers and that’s something the first movie is famously known for. They relied too heavily on Farva to deliver all the jokes and it just got old. I didn’t find myself laughing and was kinda just waiting for the movie to be over. Maybe go watch this if you are a huge Broken Lizard fan, otherwise I’d skip it.